MANILA, Philippines – For the second time in less than a week, Gilas Pilipinas suffered another heartbreaking loss, this time, against Haddadi-less Iran, 78-70 on Monday, December 3, 2018 at the Mall of Asia Arena. The nationals needed a win to stay alive in the tournament and it was really a tough task as they matched up against powerhouse Team Iran. After serving a 3-game suspension, Jayson Castro-William is now back on the roster to give Philippines a much-desired boost especially in the backcourt. Castro-William’s return quickly paid off for Team Pilipinas as they took an early lead against Iran. The TNT point guard was paired with Marcio Lassiter who exploded early in the rainbow territory. Behnam Yakhchali beat the buzzer from way downtown to cut Philippines’ advantage to 20-19 at the end of the opening period. Gilas’ second unit started the 2nd quarter spearheaded by LA Tenorio. The Filipinos fared very well defensively as they forced the Iranians to a handful of turnovers but weren’t able to convert those into points. Christian Standhardinger who serves as a naturalized player became Philippines’ offensive anchor early in the second. Standhardinger had become a marked-man for the Iranians as the Fil-German dropped 30 points against them in their previous meet-up. Jayson Castro-William didn’t set a foot on the court during the 2nd period but despite that, Gilas Pilipinas maintained the margin, 39-35 to be exact entering the 2nd half. Iran got more aggressive in the 3rd quarter and even snatched the lead from Philippines courtesy of multiple FIBA tournament-veteran Mohammad Jamshidi. 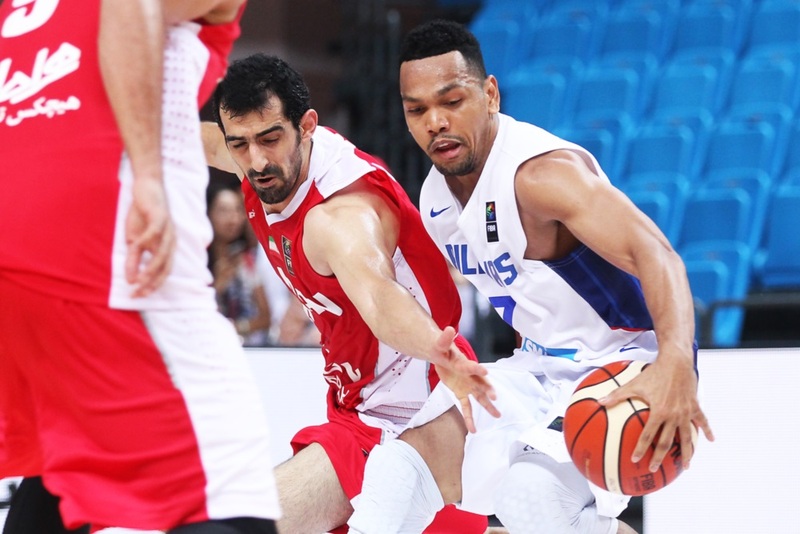 As Iran gained its momentum, Jayson Castro-William stepped on the gas once again to reclaim Gilas Pilipinas’ advantage. To sum up the low-scoring 3rd period, both the Philippines and Iran fought it all out at the free throw line as both squads displayed outstanding defensive stops on each other. Gilas Pilipinas held onto its 4-point lead at the end of the penultimate quarter, 54-50. Without stars Hamed Haddadi and Nikah Barami on its rotation due to injuries, Iran had hard times in getting away from Philippines like what they used to do in the previous games. It’s winning time for both teams as the final chapter of the game unfolded where Gilas Pilipinas widened its lead to 8. Team Pilipinas’ advantage early in the fourth was just momentarily as Jamshidi forced his way to the basket several times to put Iran at the helm with over 6 minutes left in the game. Mohammad Jamshidi waxed hot in the 4th quarter and so did Jayson Castro-William for Philippines who single-handedly erased Iran’s 5-point lead before the 2-minute warning. With 16 ticks left, Iran ramped up its lead to 6 due Gilas’ miscues. Few seconds more and it was all over for Philippines as Iran handled Gilas Pilipinas its second home loss, 78-70 in less than a week. With the debacle, Japan officially overtook Philippines for the 3rd place and Team Pilipinas dropped to 4th place with 5-5 win-loss record. Philippines still has the chance to get through to the World Cup if they win its next 2 road games against Qatar and Kazakhstan in February and Japan loses at least 1 of its last 2 games in the 6th window.